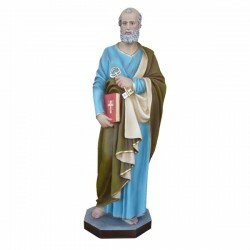 Statue of Saint Peter of 110 cm. 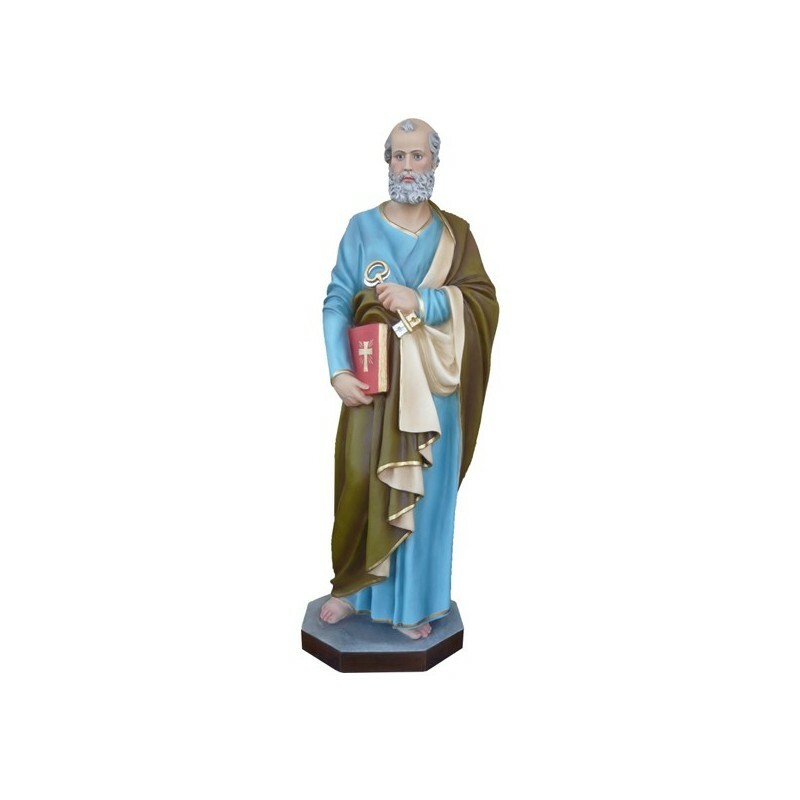 Statue of Saint Peter, 110 cm of fiberglass, handmade in Italy. Saint Peter was an apostle and a martyr who is commemorated on the 29th of June, on the 22nd of February and on the 18th of November. Simon was son of John and he worked as a fisherman in Galilea. When he got married he lived in Betsaida. He was disciple of Saint John the Baptist and then, with his brother Andrew, he became a follower of Christ, who named him “the rock”. (Cephas, Petros, Petra, Peter). The climax of his Gospel is when he confessed that Christ was the Son of God and that Christ replied him “You are Peter and on this rock I will build my Church. I will give you the key of the Heavenly Kingdom”. After the resurrection, Christ confirmed this promise saying: “Graze my sheeps” . In the Gospels, Peter is always described on the side of God. He attend the most important events, like the resurrection of the Giairo’s daughter, the Transfiguration and the agony in Getsemani; after the Christ’s Ascension he managed the Jerusalem’s community. He was probably the bishop of Antioch and the leader of the Church in Rome, where he was martyrized on the Vatican Hill. His relics are preserved under the altar of the Confession in the St. Peter’s Basilica. He is illustrated while he is wearing the clothes of that time, with a book and one or two keys in hand. He is the patron of Rome, Lamezia Terme, Lissone, Assemini, Villa San Pietro, Brema, Colonia, Las Vegas, Umbria, Galatina and also the protector of the Popes, the fishermen, the bakers, the engineers, the harvester, and of the watchmaker.